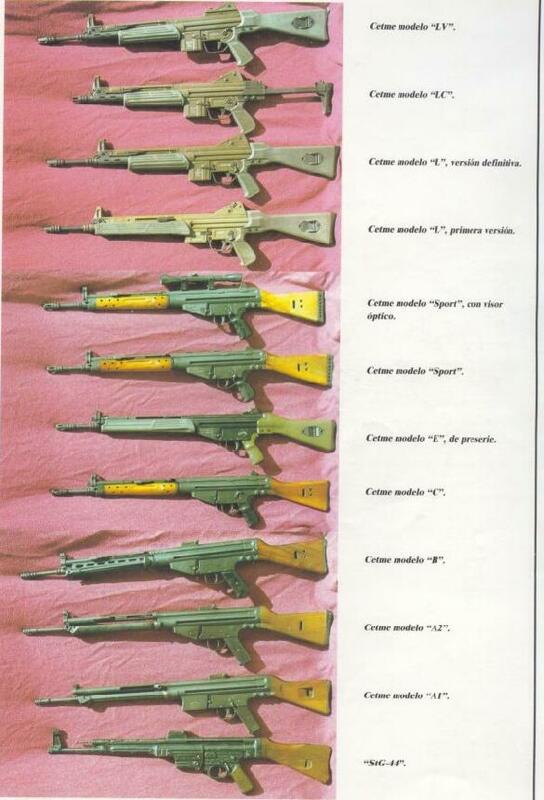 This picture shows all the CETME rifles ever manufactured. Please note that currently, the state-owned CETME (Centro de Estudio Tecnico de Materiales Especiales, or Special Materials' Technical Study Center) has been privatized, it has changed its name into EMPRESA NACIONAL SANTABARBARA, and it is owned by the GENERAL DYNAMICS CORPORATION. Their rifles still mantain the denomination CETME, and the last CETME rifles (the .5'56-NATO models L, LC and LV) were manufactured under the tradename SANTABARBARA "CETME" MODEL... The .7'62-NATO models have been phased out shortly after the fall of the Franco's fascist dictatorship over Spain, and now the .5'56-NATO CETMEs are going to be replaced by the HECKLER&KOCH G36-E (E stands for EXPORT) assault rifle. Since Spain have already got a small load of those rifles directly imported fron Germany, they however already decided NOT TO DEPEND on Germany for the furniture of those rifles. SANTABARBARA will probably license-manufacture it in Spain, under the name "CETME FAS-36" ("FAS" stands for Fusil de Asalto, or Assault Rifle).